As mentioned above, the shape of the Shoei Qwest Helmet is different than the RF-1100. It is slightly rounder and more along the lines of the RX-Q. 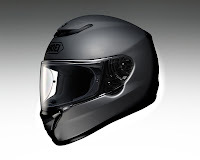 In doing so, this helmet is able to accommodate a wider array of riders and also provides ample space for the mouthpiece of a bluetooth communicator, keeping in mind that many touring riders love those. It also is a full 1.2 dB quieter than the RF-1100 when riding at highway speeds. This comes as a result of the repositioning of the ventilation, which, as I said, is designed to flow the most air when riding upright. The difference in noise-level and how much quieter this lid is becomes quite noticeable when hitting highway speeds. Four different shell sizes are utilized for a total of seven helmet sizes (2XS-2XL) for precise fit and maximum compactness. It weighs in at an average of 3.6 pounds which is relatively light for a helmet designed for long distance touring. The AIM+ shell fuses a blend of Fiberglass, Carbon Fiber & Dyneema together for lightweight performance coupled with remarkable strength. It utilizes the same shield as the RF-1100 and X-12 as well which is the CW-1, a mist-retardant anti-fog shield that features tool-free quick release and spring-loaded detents for a firm seal against the top gasket providing superior rain protection. 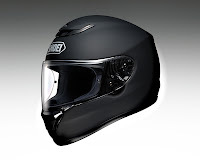 The Shoei Qwest has great balance and weight distribution. The ergonomics and aerodynamics are well thought-out. It flows a great deal of air for the touring rider and, well, it's a Shoei helmet so you know what to expect. This helmet is going to be an absolute home run. 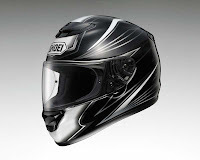 Check out the competition by visiting our Touring Helmets page at RevZilla.com.